This week is so full of sketch comedy shows in Philadelphia that it’s almost as if – Christmas came early/Hanukkah was extended/the Krampus didn’t bite off the appendages of your misbehaving child – this year. But before you get upset that I only noted the Christian, Jewish and Pagen gift giving holidays as metaphors… What’s that? It’s too late and you’re already upset? 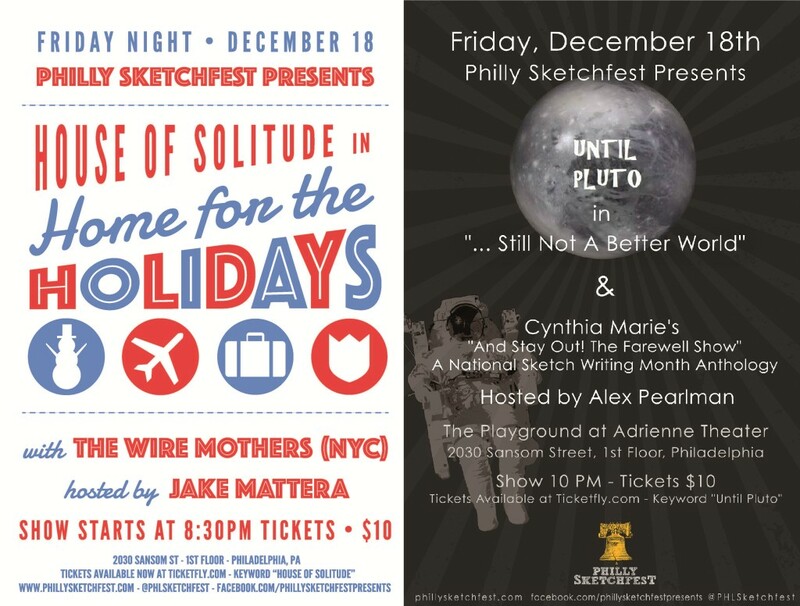 Okay, then we’ll just get to this week’s listings of sketch comedy in Philadelphia which features our own monthly Philly Sketchfest Presents showcases at The Adrienne Theater Playground including House of Solitude’s ‘Home for the Holidays’ featuring The Wire Mothers and host Jake Mattera at 8:30pm as well as Until Pluto’s “…Still Not A Better World” featuring Cynthia Marie’s Farewell Show and host Alex Pearlman at 10:00pm.